“Phoenix Rising Yoga Therapy is a holistic healing art combining the ancient science of yoga with elements of contemporary body/mind psychology. It’s based on the idea that unresolved emotional experiences stored in the body/mind, are often hidden from our conscious awareness. Thus, the body’s natural freedom is inhibited by un-awareness. Over time, our bodies begin to wear the posture reflected by our beliefs, creating deep-seated tension…. Yoga is perhaps one of the oldest somatic therapies. Phoenix Rising Yoga Therapy is a body-oriented process that uses Hatha yoga postures, supporting people to empower themselves, to create balance and to manifest a sense of wellness. 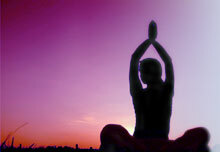 During a session, the practitioner assists the client through a sequence of specific postures, (yoga assisted postures). These are based on the client’s intention for a given session. The practitioner facilitates the client’s awareness within each stretch physically, mentally, emotionally, and spiritually. The experience of each posture is supported at an edge, allowing the client to access vital information or cellular memory. Some clients are particularly challenged by the experience of having being physically supported. As the process unfolds, the clients have the opportunity to explore, re-align, release, remember, to resource and perhaps make different choices. Incorporated into the session are a body scan, breath awareness, polarity therapy and dialogue each of which resulting in deepening the experience. Many clients sense a profound awareness of themselves; a sense of peace or an “aliveness” and a deeper resonance between what is “inside” and what is “outside”. Many clients are filled with wonderment as their life story unfolds. The client is fully supported in the exploration, enabling a body-oriented integration.